Here are three questions to ponder today. 1. What does it say about a movement when some of its loudest voices refuse to engage in public discourse with any individuals who may have opinions different from their own? 2. What does it say about a movement when some of its loudest voices freely circulate highly sensationalized but completely unsubstantiated data – yet refuse to stand up to challenges to confirm that data? 3. What does it say about a movement when activists march on city streets carrying signs that are deliberately designed to scare people with skewed, false or unrelated data – and they don’t even know it? I have a personal reason for writing this post. I used to be an anti-GMO blogger as many readers know and it was just these types of questions that, when answered, compelled me to make the only decision a rational, thinking person could make – to cut and run! I still observe the movement – from the perspective of my rear view mirror. As my Honda pulls further and further away, the hype is getting smaller, the fear fading around each new bend. And the void-of-information-coat rack that the movement hangs its hat on? That is the one thing in the movement that gets bigger as I settle into cruise control. I know the activists mean well and think they are saving the world but all I have to say is bub-bye. This isn’t for me. Let’s get into more detail about the questions above, shall we? What does it say about a movement when some of its loudest voices refuse to engage in public discourse with any individuals who may have opinions different from their own? On June 4 there was to be an unprecedented debate at the CATO Institute in Washington DC. Originally dubbed “The Great Biotechnology Debate: Food and Farming in the Balance” – it was to feature prominent spokespeople from both sides of the genetically modified table. We are talking heavyweights here. From the anti-GMO side we had the movement’s leading crusader Jeffrey Smith, founder of the Institute of Responsible Technology. Alongside Smith via Skype was to be Gilles-Éric Séralini, well-known in both camps for his controversial study linking tumor growth on rats to being fed GM corn from birth. Balancing out the roundtable were pro-science proponents Kevin Folta, University of Florida plant geneticist and Jon Entine of the Genetic Literacy Project. Sparks were sure to fly but some understanding would eventually be reached, right? Wrong. Both Smith and Séralini cancelled citing less than convincing reasons for doing so. The event will still go on but with a new name and different format. Read Entine’s account of the story here: Anti-GMO leaders withdraw from ‘Great Biotech Debate’; Forum will go on. The refusal of these movement luminaries to jump in the ring and defend their strong anti-GMO position is a let down to say the least. Let’s move on to question two. What does it say about a movement when some of its loudest voices freely circulate highly sensationalized but completely unsubstantiated data – yet refuse to stand up to challenges from mainstream science to confirm that data? This question harkens back to March 15 of this year and the now infamous “Stunning corn report” originally posted by Moms Across America, a very vocal branch of the anti-GMO tree. After its initial posting, the corn comparison table was widely syndicated throughout the blogosphere, and I do mean widely. Ideal fodder for the GMO bashing I-told-you-soes, every major anti-GMO website picked it up and ran with it, including Mercola.com which has wide circulation and is cited as gospel by its loyal followers. Skeptoid’s Josh DeWald, known for exposing psuedo-science in Mercola articles, wrote: Given that the study […], has little to no methodological information other than the (corn) fields being “side by side”, it strikes me as irresponsible to use it as the source for an article that will potentially be read by thousands or hundreds of thousands of people. Actually Josh, maybe more like millions when it’s all said and done. DeWald wasn’t the only one who had issues with the report. Kevin Folta (mentioned above) blogged that the data couldn’t possibly reflect corn of any kind but was most likely soil data if it was indeed any kind of real data at all. Concerning the data, Folta humorously wrote, “Wait a minute… there’s more copper, zinc and iron than carbon in a corn kernel? What?” For the full post see Folta’s blog Illumination/Anti-GMO Data Stokes Alarm. 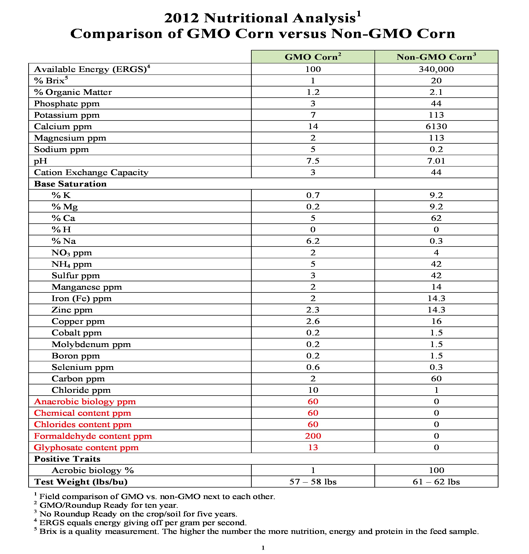 Folta recently revisited this corn comparison on his blog in an attempt to settle this matter once and for all via a re. The idea was to design and carry out a test that could be replicated in multiple locations. Moms Across America founder Zen Honeycut, Howard Vlieger (the person who supposedly conducted the original test) and the other interested parties were invited to participate. Things started to turn wishy washy during the initial emails and finally the entire group backed away from the redo entirely. The record is all there at Illumination. Starting with Verifying Stunning Corn Data, you can follow the story on Folta’s blog. Again, this to me is another disappointment on the part of the anti-GMO movement. Hey guys, if you’re so sure your corn table is correct, why not agree to try to replicate the data? That’s how science gets taken seriously. Needless to say, in the meantime this corn report has scared millions of people worldwide into thinking GM corn is not only lower in nutrition, but actually toxic. Perfect segue into the third and final question. What does it say about a movement when activists march on city streets carrying signs that are deliberately designed to scare people with skewed, false or unrelated data – and they don’t even know it? 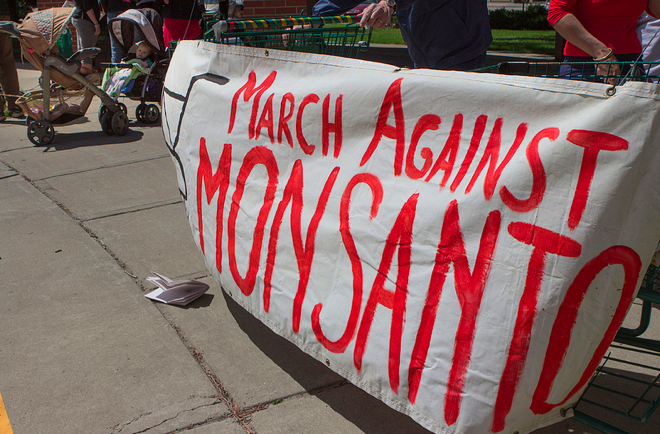 The most recent iteration of the movement was the “March Against Monsanto” (MAM) event which happened this past Saturday, May 25. Some 436 cities and 52 countries worldwide were involved and I considered attending the Portland rally to take in the costumes and signs and snap some photos, but it was very far across town for me and I really needed to get my hair done so I got a cut and weave instead. Some of the signs carried in this global effort were constructive in their asking for labeling and more transparency about what is in our food. Others, however, were just plain wrong or misleading. Granted, some, like the one pictured left score an eleven in cuteness but of course, placing any sign in the hands of an adorable little girl is going to melt hearts. There was a well dressed gentleman marching in Los Angeles with a gas mask over his face. Nice effect. Does he know that there is evidence that pesticide use has declined because of GMOs? (See In Their Own Words: Farmers Weigh In On GMOs) In South Africa, a tribesman clad in traditional garb wielded a sign that read: Monsatan – famine, poison and disease. Yikes! (Images described above can be seen here and here). It’s interesting to note that much, if not all of this protesting and marching was going on sans input from farmers who actually use Monsanto seeds. I saw a few Save our farms signs but did anyone bother to ask any farmers how they actually feel about GMOs or Monsanto? Click the links below to find out. If you’re a farmer who supports the March Against Monsanto, I welcome your perspective and would love to hear from you in the comment section. In conclusion, I’d like to reaffirm that my answers to these three questions led me away from the anti-GMO movement, and I haven’t regretted the about face for even a moment. May I go out on a limb and suggest that it’s a terrible waste of time and resources to bark up the wrong tree? As a sleuth, I want to get to the heart of health issues with the full support of evidence. The timeline of my going from anti-GM to pro-science is in tact and well documented here on Sleuth4Health (see Why This Blog and Why Do I Care So Much?). If you’re interested in reading how the conversion conversion happened, read Science Is Laughing At Us or How To Temper A GMO Blogger: My Story. #1 is something I encounter a lot. In fact last week I, and several other farmers, were kicked off yet another facebook page. There are online communities where they just will not allow information that doesn’t not fit certain narratives be seen. In many cases it does not matter how polite you are and how careful you are with your words. For some no amount of kindness or logic will work. I’ve been banned from facebook pages for providing such rude comments like “I’m excited that we have started using cover crops on our corn and soybean farm.” That was in response to a status asking what people are doing to be more sustainable. I’m sure it was the inclusion of corn and soybeans that got me banned. I’m totally fine with someone pushing their ideas on their forum, but I can’t think of another farmer blogger like myself who would kick people off their site merely for having a different opinion. Threatening life and property might get you kicked out, but not just having another point of view. As much as some of these anti-whatever people want you to know your farmer, they are pretty particular about which farmers they’d like you to know. Why would a farmer who supports GMO’s WANT to be in a site that is AGAINST GMO’s?? Would you want to belong to anti-gay group if you were gay?? The only reason you would want to belong to that group anyway would be to ague with the members within. Anti-GMO groups are busy informing their members with articles from reliable sources. We are busy organizing. That is why the group was created. It’s not for anti-GMO people. LOL. We do not want to waste our time reading comments from people who claim they are interested in science when there really is no long term studies on GMO’s, other than short term 3 mo studies that monsanto pays for. If you pay someone to do a study the results will come out as you see fit or you don’t use that company anymore. The FDA really needs to be the ones paying for these studies instead of the corporations policing themselves. We all know how great they are at policing themselves. That is why all of our politicians are bought and paid for. This article is a joke written by a bitter woman who is mad she was kicked out of a FB group. Get over it and quit crying. Was I ever kicked out of a facebook group? So someone who has, say, spent the better part of their adult life farming or studying genetics in a university is just ‘claiming’ an interest in science? Is it your intent to say they’re not really interested in science? 1. Independent scientists like me will not give “results as you see fit”. No. I’ve trained and studied almost 30 years to get where I am. Fraud ends a career, instantly. Companies come to us for contract research for our enhanced expertise. We get a tiny amount of money, do the work, and report the results. We usually don’t know what they want or what they are looking at– they want an independent verification to make sure they are not wrong. It is most uncool to suggest that independent, pubic scientists are all frauds and liars. Remember, most of us could have (or did) work for the private sector but chose not to build a career there. A lot of it is company politics, business practices, etc. Maybe you should not be so quick to conclude that we are somehow all in collusion. 2. No long-term studies. This has become the mantra of anti-GMO. Do you know why there are no long-term studies? No real scientist wants to do them. There’s no reason to. There’s no merit in it. Transgenic crops are safer than conventionally bred crops. We all know that because we know what genes do, we can study them. Epidemiological trends over the last 15 years confirm their safety. I’ve made a standing offer to co-submit a proposal to NIH on the long-term study of transgenic crops. Any animal scientist that wants to do this test needs to contact me and we’ll write the proposal. I have plenty of plant genomics ability and can hold up the plant end. I need a partner to do animal studies and histology/pathology. Nobody will take this offer, and if they did, it would not be funded. Why? There is no scientific reason or evidence that suggests it should be done. I would suggest that anti-GMO groups maybe get Greenpeace, Institute for Responsible Technology and other anti-GMO entities to come together and fund the long-term research they desire. Get a scientist like me that favors trangenic technology (but can change his mind with evidence) and maybe a guy like Seralini to design and conduct the research together in separate locations. You’ll NEVER see these organizations step up to the plate and fund/perform real independent studies from the anti-GMO side. NEVER. Their stranglehold on the gullible relies on unknowns and fear. Once it was shown by their darlings that there are no long-term effects, the movement gets another black eye. See what you can do. Get anti-GM organizations to pay for independent testing. I’d be glad to help coordinate that or assist in the design, analysis or interpretations. It’s all about getting to the truth. Thanks. Trina, I forgot to mention. My lab, and most labs, will never consider taking a research contract unless we can publish the findings. The process is transparent, the data are what the data are. We don’t care what companies say. Listen to you with you’re 30 years study just to end up some pawn in an industry. You’re nothing special, a cog in a well oiled machine if you like so no need to patronise anyone . Maybe Gmos are safe, maybe they’re not. I object on principle. We don’t need them. There is enough food in the world. It’s just not getting to the people who need it most. So it doesn’t matter if it’s gmo or not. How much did they pay you to retreat? Were it only true! But, alas, nothing. No one paid me a thing. Yes Huffpo does seem biased on this front. I was mainly referring to smaller communties that individuals like myself and Julee have created on our own. You know, minus the kicking people off for not agreeing with us part. I think its a travesty that the people who know the MOST about GMOs – that would be farmers and plant scientists – are the ones LEAST allowed to talk about them on anti-GMO sites. These are the folks who work with this stuff EVERY DAY. It is their job to know what they’re doing. They’re livelihoods and their reputations are on the line. Here is an anology. I teach music. If someone had a discussion on a blog about how they don’t trust music, but they weren’t a musician themselves, would all comments by trained musicians be discounted if they didn’t fall in line? That is the hardest part. There is really no convincing the other side on this argument we just wish people were more willing to understand why us farmers are using GMO’s and that we wouldn’t be involved in them if we didn’t do the research, get informed and know that they are safe. People around the world need to eat and that is what GMOs are allowing us to do. We have healthier soil, more microbes and earthworms returning to the ground and the farmers heath is also improving with the cut of insecticides. It would be nice to see people to a common ground on this issue but it seems like screaming at us for doing our jobs is what we will deal with for the time being. @growingseason: Sounds like you might have needed the gas mask BEFORE you started using GM seed, not after! When I learned just how the Bt mechanism worked, how tight it is, how specific, I was blown away and that was a BIG part of my change in views. The way Bt crops actually work is nothing like what the propaganda says. We do still live in the United Sates of America..right?? Not the united States of Big Ag, Pharma and chemical company profits America!! If GMO’s are so super wonderfully safe and nutritious..what is the problem with labeling them and giving full discloser?? Don’t tell me it is because there is no difference between regular, organic and GM foods.. Obviously there is a difference or there would be no patents on seeds & crops..because you cannot patent nature. (oh..it’s because American consumers are too stupid and scared to do their own research and make their own decisions based on full dis closer of what is in their food to make their own choices about what they feed their families..They would get too confused..So the big and wonderful chemical companies must hide the super safe and nutritious information from us for our own good..rolling my eyes) Truly fiction..it’s all about profits profits profits..
Why does Monsanto et al find it necessary to bully and threaten and sue farmers when their super safe and nutritious GMO pollen transfers to the organic farmers crops through no fault of their own?? And lastly..sorry..safe or not safe, which can be debated, no super giant chemical company should be controlling the worlds food , pharmaceutical & pesticide supply.. I will continue to support my local,small organic farmer, grow what I can and avoid spending any of my hard earned tax dollars on any product containing their super safe and nutritious ingredients.I dare you to give me a good and sound reason why I should not be able to do just that. @Babs: You absolutely DO have the right to eat whatever you want! No one, and certainly not I, is trying to take that choice away from you. I support local farmers too! Most of my produce during the summer comes from a small CSA about 15 minutes from my house. All I’m trying to say here is that the movement needs to get its facts straight and stand up to mainstream science. A lot of the information it bases its biggest arguments on is skewed or blatantly false. That’s what has been such a disappointment. Also, this post isn’t really about Monsanto. I brought up the Monsanto March because it was timely and anyone who marches against Monsanto is likely against GMOs, though not always. Genetic engineering, or genetic modification is a technology, not a company. By all means support your local farmers, but talk to them also. Did you know that all GMO’s are not alike? There is the genetic change made to produce golden rice which adds carotene so that those who do not get enough of this disease fighter might live longer lives. There are genetic modifications that allow plants to live on less water, or produce more using less nutrients. Did you know that the Bt produced by corn plants in Bt corn is the same substance that has been approved for use on organic produce? Please do not paint all GMO’s with the same brush, there are so many of them, and they are all very different. The story of bullying farmers is often repeated, but if you read the trial proceedings you find out that in the one documented case of Monsanto taking a farmer to court, that farmer/ seed dealer, set out to steal the genetics from Monsanto. Would you allow someone to steal the produce of your hard labor? Oh and sorry, but Monsanto does not hold the monopoly on GMO’s. There are many companies, and even universities that are doing the same thing. Control of the worlds food is not in the hands of only one company. No farmer tried to steal genetics from Monsanto, that’s ridiculous. They’re crops were cross pollenated from neighbouring farms. No one is allowed to resow they’re seeds once they are contracted to Monsanto, so they cleverly sent teams round to take samples from crops. Monsanto threatened said farmers with court if they found they’re modified genes in peoples crops. Now Monsanto does have a monopoly over america’s corn industry. An 80% monopoly and growing. So keep painting a pretty picture, we all know you use excrement for acrylic. In product liability it is not up to the consumer to prove the product is safe, it is up to the manufacturer. Just because the nutritional value is on par would not mean there are not additives that are harmful to the delicate balance of our ecosystem and no one has proven that their products are safe for our bee colonies, which are collapsing. It is also our right to ask for totally independent testing and labeling. Free speech in action, baby. However, I do agree that the negative campaign against Monsanto is not working. What we need are visionary campaigns, not negative campaigns. You can’t prove a product is safe; you can only prove it isn’t. Proof left as an exercise for the reader. It’s not working because not enough people are aware of it. The “blowback effect” describes how people become more entrenched in their position when confronted on core facts. Rather than asking “is this contrary information true or false?” most of us are looking for “how can I prove this is false”. People who have no information and no position may be open to persuasion one way or another, but once they’ve made up their mind according to the first persuasive argument they encounter, it’s rare that they can change it. There’s a famous quote attributed to Mark Twain: “It is easier to fool people than to convince them they’ve been fooled”. I think this is because our self-image is one of sophistication and we think other people are more gullible than we are. Finding out that we’ve been fooled is a blow to our persona and so we have built-in defense mechanisms (cognitive biases) to protect it. I’ve also got a new piece in my “Thoughts on Things” series about GMO labeling issues. Thanks for your comment and I loved your post. I wish more people would critically consider their views the way you have. Readers, click on the link above… please! I have wanted to visit “Less Wrong” for awhile. It’s time! “1. What does it say about a movement when some of its loudest voices refuse to engage in public discourse with any individuals who may have opinions different from their own? Thanks for a well written and thoughtful article Julee. Your comments echo my own thinking on the matter. Regarding the photo about the bees, I heard about a news story very recently that might have provoked that message. There is a claim (unsubstantiated as far as I know) that a colony of bees were confiscated by the Illinois department of agriculture because they had developed a natural resistance to round-up. Search on Google and you will find details in the usual forums but coverage is noticably absent from leading science journals and major news outlets. @Mark: Thanks for your comment. I will google that bit about the bees but you’re right, if major news outlets haven’t touched it and scientists aren’t jumping up and down about it in labs across the globe, strong dose of skepticism advised! Can you imagine the boon to a career if a scientist discovered precisely what was killing bees? Magazine covers. Nobel. @Mark: Something else occurred to me overnight… Europe has the same bee crisis as we do and they don’t grow GM crops. We have a bee crisis because of the nicotinoid insecticides, and possibly organo-phosphates we are using. So the fact that we don’t grow GM is irrelavent. But they also use round-up. In ancient times they use the term “Hack-Früchte”. 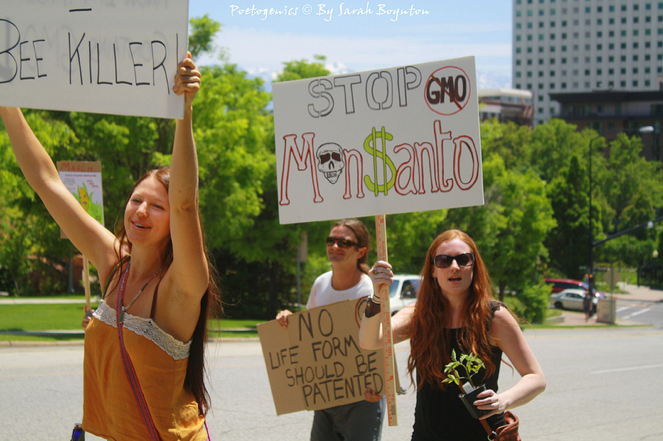 the anti monsanto brigade…..looking for simple solutions to complex global issues. I find discussing global food suply issues with the anti monsanto/gmo peeps to be much like discussing theology with an evangelist.